Things didn't look too bright for the Hubble Space Telescope when it first went into orbit back in 1989: the $1.5 billion eye on the universe had gone into space with its light-gathering mirror polished to perfection, which was very good, but the mirror was also the wrong shape  which was very bad. It wasn't until 1993 that the shuttle Endeavour went aloft with a set of corrective optics  essentially space telescope glasses  that sharpened Hubble's blurry vision and allowed it to begin conducting the stargazing work it was built to do. Since that exercise in orbital optometry, Hubble has been sending home one astonishing photo after another  and one scientific breakthrough after another too. This week the telescope celebrates its 22nd birthday in orbit, and the folks at the Space Telescope Science Institute (STScI) are handing out party favors in the form of a dazzling new space image. Even by Hubble standards, it's pretty extraordinary. The photo  actually a mosaic assembled from 30 separate images  captures an enormous swath of space that's home to the biggest population of giant stars ever found. 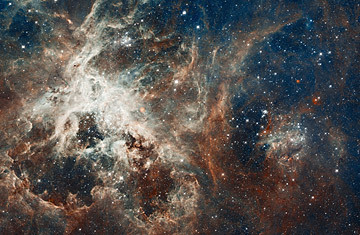 It's a swirling cloud of gas and dust known as the Tarantula nebula, and despite its forbidding name, it does some very creative work  serving as a nursery for entirely new stars. At the heart of the nebula is a stellar cluster known as NGC 2070, less than 3 million years old, containing about half a million young stars  some of which weigh in at as much as 100 times the mass of our own sun. The ultraviolet light spewing from these intensely hot bodies has carved out gaps in the surrounding cloud, much as the very first stars in the universe cleared gaps in the fog of gas that condensed out of the Big Bang. Not only that: the shock waves created by the barrage of ultraviolet are probably triggering yet another round of star formation that has barely begun. Hubble's portrait of the nebula is remarkable for more than just the science: even after the telescope was repaired in 1993, it couldn't have captured such an image. That's because the two instruments that did the photographing  snapping 15 pictures each  weren't even on the original Hubble. Known as the Advanced Camera for Surveys and the Wide Field Camera 3, they were installed by spacewalking astronauts during shuttle missions in 2002 and 2009, respectively. What makes the composite portrait all the more impressive is that the Tarantula nebula is nearly 170,000 light-years from Earth. It's not even part of our own galaxy; instead it lies in the dwarf galaxy known as the Large Magellanic Cloud. At this distance, most telescopes could pick out only a few individual stars; the Hubble, flying high above the blurring caused by Earth's atmosphere, can resolve thousands. And that's pretty much the story anywhere the Hubble looks in the Milky Way and its immediate neighborhood. In the weeks leading up to the 22nd-birthday celebration, the STScI folks have released a series of equally eye-popping photos. One example: a shot of Messier 9, a spherical blob of perhaps a quarter-million unusually ancient stars, some 10 billion years old compared with the sun's 5 billion, that lies toward the center of our galaxy. Another is Messier 70, also a globular cluster, but with a tighter, brighter core than its cousin. All told, the Milky Way is home to 150 or more globular clusters. The Andromeda galaxy has as many as 500, while the giant galaxy Messier 87 has somewhere around 13,000. Farther afield  a lot farther  Hubble captured NGC 2683, also known, thanks to its shape, as the UFO galaxy. It was first seen by the astronomer William Herschel in 1788, but while he used the finest telescope available at the time (built, as it happens, by Herschel himself), he could only make it out as an elongated blur. The Hubble, by contrast, sees it as a magnificent edge-on spiral comprising hundreds of billions of stars. And there's plenty more to come. The Hubble is aging, and there will be no more shuttle flights to repair or upgrade it. Still, NASA could have pulled the plug on the funding to keep the telescope's observations going. But in a budget review that also preserved the planet-hunting Kepler telescope and several others, the agency decided to keep the old warhorse running for a few more years. That means a shorter gap between the inevitable demise of the Hubble and the launch of its replacement, the even more powerful James Webb Space Telescope. The Webb recently survived a budgetary near-death experience of its own, but NASA kept that mission alive as well. In 2018, if all goes well, the Webb will inherit Hubble's mantle. It'll have a heck of a legacy to live up to.